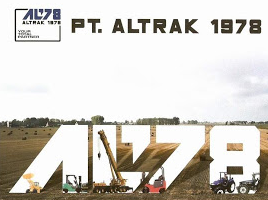 PT.Altrak 1978 merupakan perusahaan swasta berskala nasional yang bergerak dalam bidang distributor alat berat di Indonesia yang merupakan bagian dari CCM Group dan merupakan salah satu perusahaan terbesar dan terkemuka di Indonesia. - Male, max 29 years old. - Senior High School majoring in all Engineering. - Fresh graduate are welcome. - Able to Ms. Office (Ms. Word, Ms. Excel, Ms. Power Point). - Placement in BSD, South Tangerang. - Bachelor's Degree in Engineering (Civil), Engineering (Electrical/Electronic), Engineering (Mechanical), Engineering (Mining/Mineral), Engineering (Petroleum/Oil/Gas) or equivalent. - At least 1 Year(s) of working experience or fresh graduate. - Good looking, good communication skills, strong leadership potential & Healty. - Able to operate computer (Ms. Office). - Have driver license for car (SIM A). - Willing to follow the learning program. - Ready to be place at all PT. Altrak 1978 Branches. - Male or Female, max 25 years old. - Bachelors Degree in Electrical or Mechanical Engineering. - At least 3 years of working experience. - Able to draw a CAD Technique. - Able to speak English, Ms. Office (Ms. Word, Ms. Excel, Ms. Power Point). - Placement in Bintaro, South Jakarta. - Male, max 28 years old. - Bachelor's Degree in Education Engineering (Mechanical), Education Engineering (Mechanical/ Automotive) or equivalent. - At least 1 years of working experience in the same field or fresh graduate are welcome. - Able to Ms. Office. - Male, max 30 years old. - Bachelor Degree in Design Graphics. - At least 2 years of working experience in the same field. - Able to Photography, Videography, Video Editing & Graphics Design. - Male or Female, max 30 years old. - Bachleor Degree in Finance, Accounting, Economy, Management or equivalent. - At least 3 year of working experience. - Able to LINUX or Ms. Office. - Bachelors Degree in Electrical, Mechanical, Automotive and Marine Engineering. - At least 2 years of working experience. - Good looking, good communication skills. - Have SIM A or SIM C.
- Able to LINUX or Ms. Office (Ms. Word, Ms. Excel, Ms. Power Point). - Male/ Female, max 30 years old. - Bachelors Degree in Finance, Accounting and Economy. - Bachelors Degree in Mathematics, Psychology and Management. - At least 1 years of working experience. - Diploma/ Bachelors Degree in all Engineering. - Have experience in Automotive Dealer or heavy equipment industry. - At least have worked in the service advisor position. - Able to speak English. - Male or Female, max 28 years old. - Bachelors Degree in all Engineering. - Know businesses in Marine & have a marine background. - Having a good communication skill with client. - Male, max 20 years old. - Vocational High Schools, Diploma and Bachelors Degree in Electrical or Mechanical Engineering. - Bachelors Degree in Finance, Accounting, Economy, Management or equivalent. - Placement in Jakarta, Batam, Palembang, Denpasar, Samarida, NTT, Balikpapan, Batam, Banjarmasin, Bitung, Denpasar, Jakarta, Lampung, Medan, Padang, Palembang, Pangkal Pinang, Pekanbaru, Pontianak, Samarinda, Semarang & Surabaya. 0 Komentar untuk "Job Hunter : LoKer Seluruh Indonesia Terbaru 17 Posisi PT.Altrak 1978 April 2019"